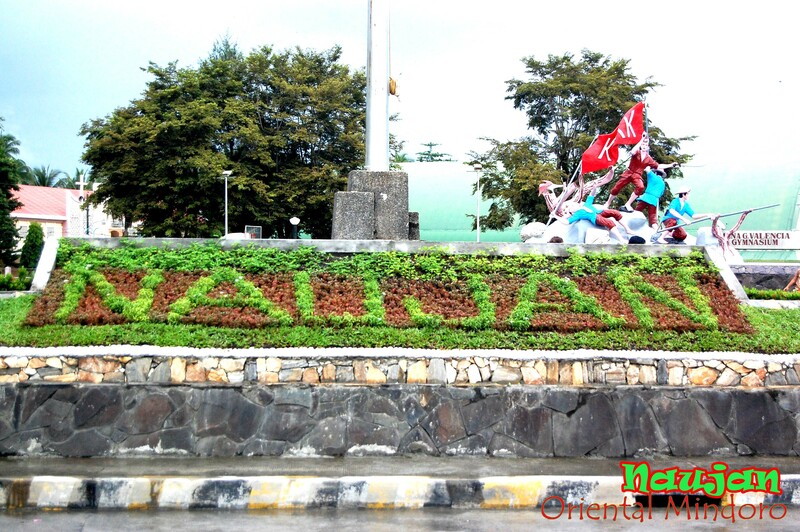 Naujan, which has a total land area of 52,804.15 hectares, is located at the center of the eastern plains of the province of Oriental Mindoro. It is approximately 34 kilometers from Calapan City, the provincial capital, via the national highway. Naujan is bounded in the north by Calapan City, in the northwest by the municipality of Baco, in the east by part of the Verde Island Passage and Tablas Strait, in the south by the town of Victoria, in the southeast by the town of Pola and in the southwest by the town of Sablayan, province of Occidental Mindoro. 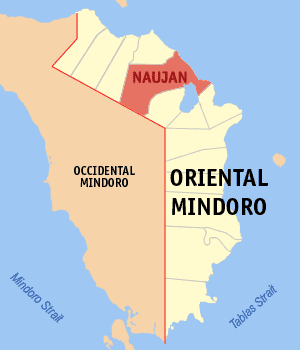 Naujan is the largest municipally in Oriental Mindoro in terms of land area, accounting for 12 percent of the province’s total land area. The topography of the municipality of Naujan is generally broad plain with rugged mountain. The most prominent landforms are Mount Naujan with an elevation of 425 meters, Mount Tinangisan with 308 meters and Dome Hill with 258 meters. Naujan falls under Climatic Type III which is described as having no very pronounced maximum rain period with a short dry season lasting from one to three months. Areas of this type are partly shielded from the Northeast monsoon. Rice, corn, coconut, coffee, black pepper, calamansi, banana, rambutan, lanzones, mango, papaya, pineapple, pomelo, guava, avocado, jackfruit, starapple, santol, guyabano, chico, tiesa, vegetables, rootcrops, livestock, poultry, fish, etc. Several rivers and streams cut across the broad plain of Naujan. The longest in the Mag-asawang Tubig, which is about 95 kilometers and traverses from San Andres, flowing towards the coast in the northeastern side into San Antonio and Estrella Bay. Other prominent rivers include the Catuiran River (Bagto) and Bucayao River. Both Bucayao and Mag-asawang Tubig are categorized as Class C by the Department of Environment and Natural Resources (DENR). The beneficial use of Class C if or recreational and industrial uses as well as for the propagation and growth of fish and other aquatic resources. Other rivers include Dulangan, Tibanglin, Bulwagan, Pinagsabangan, Matandang Naujan, Catuiran, Panggalaan, Macatoc (separating Naujan and Victoria) and Butas from which Naujan Lake flows out. Creeks in the municipality include Mapalo, Bambang, Mabini and Tabang. There is one hot spring in Pungao that extends to Buloc-buloc Bay in Barangay Montemayor. The Naujan lake is considered as a Protected Area and is classified as a national park by virtue of Proclamation No. 335 dated January 25, 1968 (restoring the lake proper as part of the Naujan Lake National Park). The municipality of Naujan, Pola, Socorro and Victoria adjoin the Naujan Lake. The boundaries covers approximately 8,125 hectares of open water, 1,363 hectares of marshland and 4,675 hectares of terrestial catchment or a total of 14,163 hectares together with the 20 kilometers length of Butas River. The outflow river (Butas) form part of the protected areas as its function is very vital in the maintenance of the fish diversity and productivity of the lake since it is the transmigratory route of fishes from the lake to the coastal areas. Quarrying activities (gravel and sand) are located along Mag-asawang Tubig River in Barangays Sto. 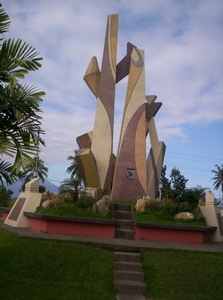 Niño, Apitong, Sta. Maria, San Nicolas, Tigkan and Bagong Buhay. These are also undertaken along Bagto River (barangay Arangin) and Dulangan River (barangay Metolza). The waterways used for these activities are highly susceptible to erosion and siltation. Geologically, Naujan was once submerged by shallow sea after last glacial period. This is reflected in, among other things, fossils of marine life found inland in the mountain slopes along the boarder with the municipal of Pola. The pre-colonial history of Naujan unfolded when Chinese ceramics and other objects belonging to the Sung period. (Sung, Yuan and Ming dynasties) were excavated in the barangays of San Jose, Dao and Sitio Bathala in Laguna. It is fairly certain that certain traded relations between China and natives of Naujan, existed over the years. Nao-Hang, as the early missionaries called the place, was established by the Augustinians in 1600 and one of the oldest towns in the Philippines. The first settlement was established apparently in barangay Bancuro, Later, as soon as it become safe from Moro raids, settlements closer to the coastlines were established, notably at Matandang Naujan and Lumang Bayan. The present Naujan became a municipality on January 04, 1905 under Act No. 1280. Its boundaries were established permanently in 1919. The mangyans who are of Malayan descent were the first inhabitants. They occupied the plains but were pushed to the interior upon arrival of Christian settlers. Now they are mostly mountain dwellers inhabiting the slopes of Mount Halcon down to the government reservation area in Metolza. These tribes are now settled in Barangays Caburo, Balite, Paitan, Magtibay and Banuton. Subsequent political developments were marked by insurrection led by Francisco Manalaysay against the Spaniards and Captain Valeriano Gasic against the Americans. The guerilla movement against the Japanese was headed by Esteban Beloncio and Gomersindo dela Torre. Father Edicio dela Torre spearheaded the movement against irrelevant systems of the modern society. Naujan at present, is a First-Class municipality, with all the amenities of a town of its size. It has a modern Town Plaza, a Conference Center (the Bahay Tuklasan), a sizeable gymnasium and a starting Track and Field for its budding athletes. It also has a series of resorts along its long coastline, a welcome presence for its people and visitors alike. Ang Naujanews Online ay nasa bagong pangasiwaan. Paumanhin sa mga bumibisita sa pahinang ito dahil nasa estado pa ng pagsasaayos. Salamat po.